These kinds of bombings are absolutely disgusting. Regardless of whether the perpetrators were Muslims, Christians, Hindus or Sikhs it doesn't make it any better or any worse, and this senseless violence against innocent people needs to stop. One thing that is regrettable about this article and is evident on the CBC website is that people are under the impression that all bombings in India are committed by Muslims and that all extremists in India are Muslims. Unfortunately that is not the case and with India's Hindu population being 80% there have been many bombings committed by non-Muslims. This is not meant to be an attack on Hindu's, but it's meant to put things in perspective which unfortunately the CBC didn't do at all with this article. At least 29 people were killed and another 88 wounded when a series of small explosions hit the western Indian city of Ahmadabad on Saturday, a day after seven similar blasts struck a southern city. Nitin Patel — the urban development minister of Gujarat state, where Ahmadabad is located — confirmed the casualties and said the blasts went off in several neighbourhoods on Saturday evening. Narendra Modi, the chief minister of Gujarat state where Ahmadabad is located, said at least 16 bombs went off in several neighborhoods of the busy city. Indian media said the explosions appeared to be caused by small bombs that went off in the crowded areas in the older part of Ahmadabad. There was no immediate claim of responsibility for either set of explosions, and it was not clear if they were connected. 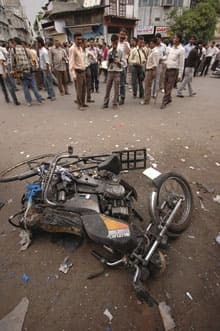 Prithviraj Chavan, a junior minister in the prime minister's office, called the explosions "deplorable" and said they were set off by people "bent upon creating a communal divide in the country" — language officials usually use when blaming Islamic militants believed to be behind bombings that have repeatedly hit India's cities in recent years. "Anti-national elements have been trying to create panic among the people of our country. Today's blasts in Ahmadabad seem to be part of the same strategy," federal Home Minister Shivraj Patil told reporters in New Delhi. The latest attacks came a day after seven synchronized small bombs shook Bangalore, India's high-tech hub, killing two people and wounding at least five others. On Saturday, police found and defused an eighth bomb near a popular shopping mall in Bangalore, said Srikumar, the director general of police in Karnataka state, where the city is located. Like many Indians, he uses only a single name. As in past bombings in India, suspicion for both sets of explosions quickly fell on Muslim militants blamed for attacks such as the July 2006 bombings that ripped through Mumbai's commuter rail network, killing nearly 200 people. Those fears were amplified by the history of Ahmadabad, a crowded and historic city that in 2002 was the scene of one of worst incidents of rioting between India's Hindu majority and its Muslim minority. The violence killed about 1,000 people, most of them Muslims. It was triggered by a fire that killed 60 passengers on a train packed with Hindu pilgrims. Hindu extremists blamed the deaths on Muslims and rampaged through Muslim neighbourhoods, although the cause of the blaze was unclear.